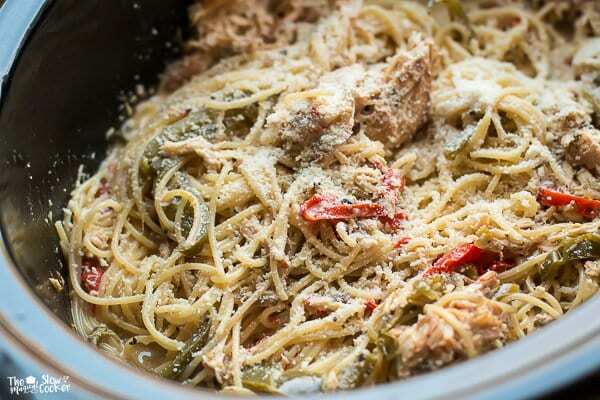 This Slow Cooker Creamy Italian Chicken Spaghetti is a take on Olive Garden’s Chicken Scampi. Creamy Pasta and chicken with bell peppers and red onion. 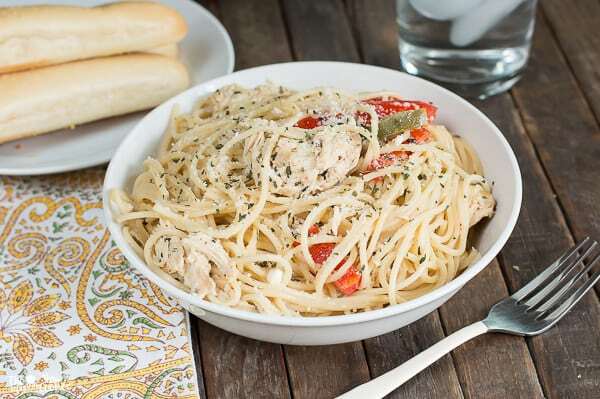 I made this Slow Cooker Creamy Italian Chicken Spaghetti to be similar to Olive Garden’s Chicken Scampi. Doing some research I found out that scampi means shrimp, but this dish has chicken in it? Olive Garden can get away with calling a chicken dish “shrimp”, but I can’t be doing that sort of thing here on my tiny blog, the Facebook comments would be endless! 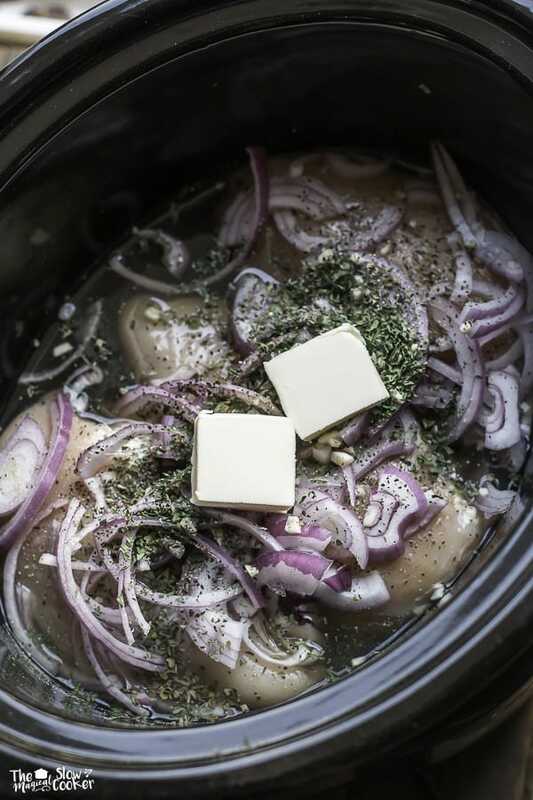 In my slow cooker I cook the chicken with chicken broth, garlic, seasonings, and butter (for more flavor) for most of the day. Then after I get home I add the rest of the ingredients. I add the bell peppers to the last hour of cooking. 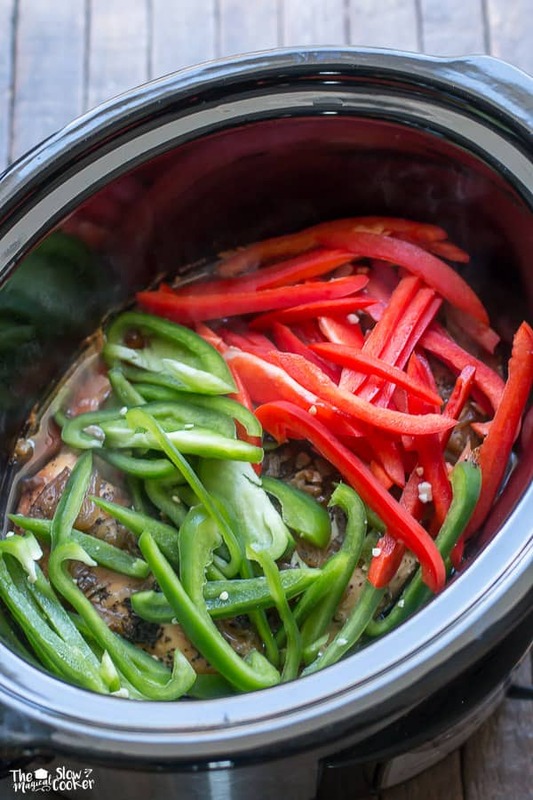 Bell peppers cook very fast once the slow cooker it hot. After the bell peppers have cooked, I shred the chicken, add heavy cream and cooked angel hair pasta and parmesan cheese. I use the shake can type of cheese for this dish, though freshly grated would be good too. This meal is loved by all in my house! My family loves pasta, and pasta is the one meal I can count on my 6-year old eating. She would love to eat Sponge Bob Mac & Cheese every night, this meal is a nice change from that! I also love that this meal is a fraction of the cost of dining out. 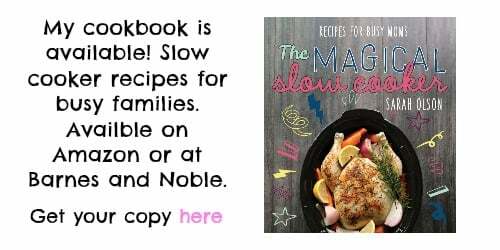 I used my 6-quart oval slow cooker for this meal. 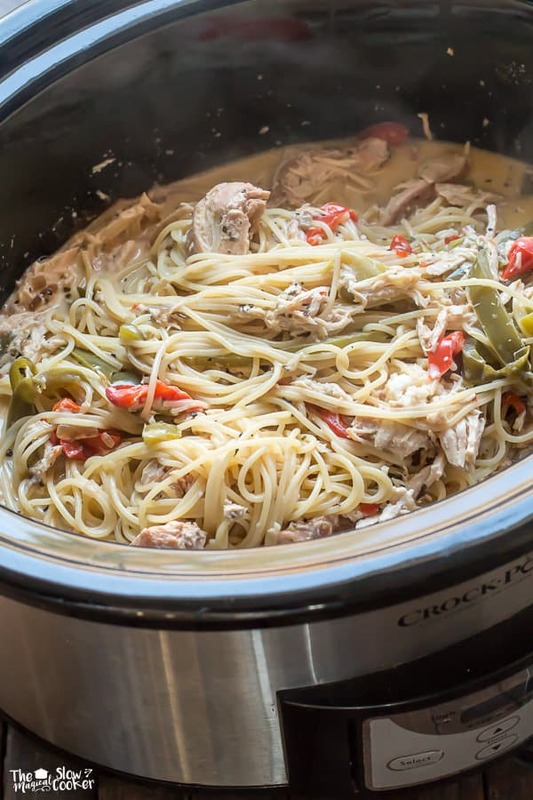 My crock pot was pretty full after adding the pasta, I wouldn’t use a slow cooker smaller than 5-quart..
Place the chicken, chicken broth, onion, garlic, basil, oregano, parsley, salt, pepper and butter into the slow cooker. Cover and cook on LOW for 7 hours. Add the bell peppers after the 7 hours is up, and cook for 1 hour more. Add the heavy cream, stir. Add the cooked and drained pasta and the ½ cup of parmesan cheese. Stir gently. Serve with additional cheese if desired. 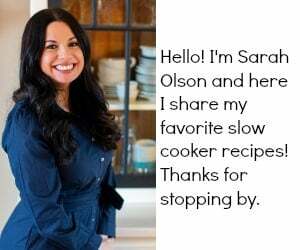 Hello Sarah, this sounds simply lovely! One question. I have had poor luck cooking boneless, skinless breasts for this long without them drying out. Always on low and in liquid, they still get dry. Do you have a secret you could share?? Thanks for sharing and this will be on the menu for our next Pasta Night!! Hi Lori! Shredding them in a sauce always helps with moistness instead of serving them whole. Lately I have been doing boneless skinless thighs for recipes that the chicken is left whole. I hope this helps! 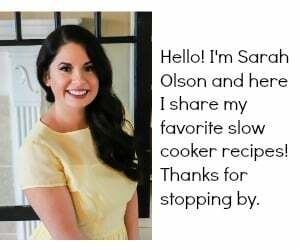 Hi Sarah, what kind of heavy cream do you use for the chicken spaghetti? Any suggestions on the brand of whipping cream? I’m new to cooking and so far my husband loved your pork chops/potatoes and apricot chicken Thanks again!!!! That’s so funny…I think I knew that “scampi” means shrimp, but I’d never thought about the fact that means that shrimp scampi means…shrimp shrimp. Anyway, this looks so tasty! 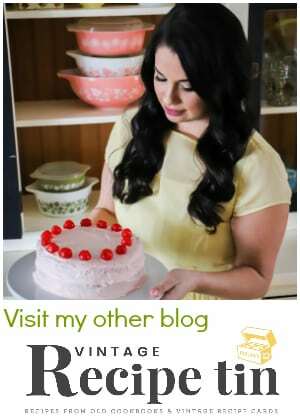 Sarah, you always make me hungry!